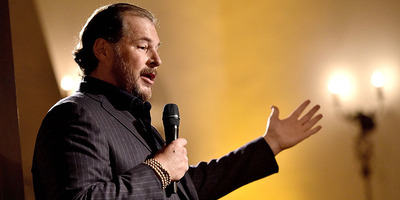 Software as a Service (SaaS) companies like Salesforce and Workday could see their enteprise values double by 2020 if they focus on growing margins, Morgan Stanley forecasts. Among 32 companies with similar profiles, Morgan Stanley projects a 21% growth in annual revenue, and 40% growth collectively in terms of earnings before interest and taxes (EBIT) by 2022. Salesforce (CRM), ServiceNow (NOW), Proofpoint (PFPT), RealPage (RP), Workday (WDAY), and Veeva Systems (VEEV) are forecast to see the biggest gains. Cloud-based software companies like Salesforce and Workday could see their values double in the next four years thanks to unique opportunities among this breed of tech companies to boost profit margins, according to the Morgan Stanley report published on Tuesday. Analysts at Morgan Stanley wrote that while Software as a Service (SaaS) stocks may look expensive to investors under most traditional valuation metrics (such as price-earnings ratios), this ignores the real potential of cloud-based software companies that have recurring-revenue businesses. “Across our coverage group of 32 subscription-based models, we saw an average 30% revenue growth in 2017 (29% median),” the report says. Companies in this group could see 40% growth in terms of earnings before interest and taxes (EBIT). Collectively, these companies generate $US3 billion in EBIT, which Morgan Stanley forecasts will grow to $US16 billion in EBIT by 2022. Among the stocks Morgan Stanley marks as most likely to see gains are Salesforce (CRM), ServiceNow (NOW), Proofpoint (PFPT), RealPage (RP), and Workday (WDAY), and Veeva Systems (VEEV). “Across our 32 recurring revenue software companies, we see significant room for revenue growth and profitability expansion,” the report says. With these gains, some of the SaaS companies could double in enterprise value, Morgan Stanley says. 8×8 Inc., AppFolio, Appian, Box, Cloudera, Coupa Software, Castlight Health, EllieMae, Five9, GoDaddy, HubSpot, Instructure, Mindbody, Medidata Solutions, MongoDB, New Relic, Proofpoint, Qualys, Q2 Holdings, RealPage, Red Hat, RingCentral, Salesforce.com, SendGrid, ServiceNow, Shopify, Sophos Group, Veeva Systems, Workday, Workiva, Yext, Zendesk.